Fee Rules Updated 28 November Name of Rules These rules are the Fee Rules Commencement These rules commence on 1 January 2014. Download "Fee Rules 2014. Updated 28 November 2013. Name of Rules These rules are the Fee Rules 2014. Commencement These rules commence on 1 January 2014." 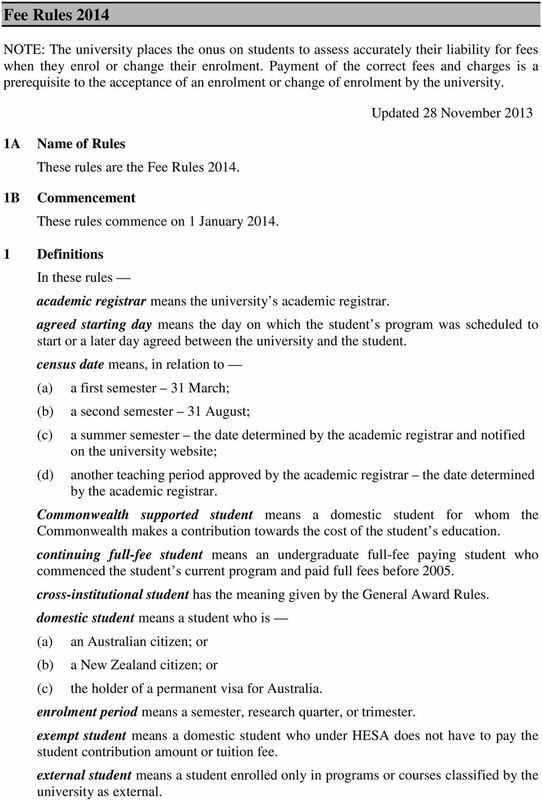 1 Fee Rules 2014 NOTE: The university places the onus on students to assess accurately their liability for fees when they enrol or change their enrolment. Payment of the correct fees and charges is a prerequisite to the acceptance of an enrolment or change of enrolment by the university. Updated 28 November A 1B Name of Rules These rules are the Fee Rules Commencement These rules commence on 1 January Definitions In these rules academic registrar means the university s academic registrar. agreed starting day means the day on which the student s program was scheduled to start or a later day agreed between the university and the student. census date means, in relation to (a) a first semester 31 March; (b) a second semester 31 August; (c) a summer semester the date determined by the academic registrar and notified on the university website; (d) another teaching period approved by the academic registrar the date determined by the academic registrar. Commonwealth supported student means a domestic student for whom the Commonwealth makes a contribution towards the cost of the student s education. continuing full-fee student means an undergraduate full-fee paying student who commenced the student s current program and paid full fees before cross-institutional student has the meaning given by the General Award Rules. domestic student means a student who is (a) an Australian citizen; or (b) a New Zealand citizen; or (c) the holder of a permanent visa for Australia. enrolment period means a semester, research quarter, or trimester. exempt student means a domestic student who under HESA does not have to pay the student contribution amount or tuition fee. external student means a student enrolled only in programs or courses classified by the university as external. 3 (iii) misbehavior by the student. student services and amenities fee (SSAF) means a fee for student services and amenities of a non-academic nature, the maximum annual amount for which is legislated by the federal government. study period means a semester, trimester, research quarter, MBBS rotation or teaching period. tuition fee means the fee an overseas student or a domestic student not being a Commonwealth supported student pays for each program or course. 2 Payment prerequisite to enrolment (1) A person is not taken to be enrolled in a course until all relevant fees have been paid to the university. (2) If a proposed change of enrolment would incur an increase in a fee, or an additional fee, a change of enrolment will not take effect until all further amounts have been paid to the university. 3 Student contribution amounts for Commonwealth supported students (1) A Commonwealth supported student must pay the applicable student contribution amount determined under Schedule 2, unless the student is an exempt student. 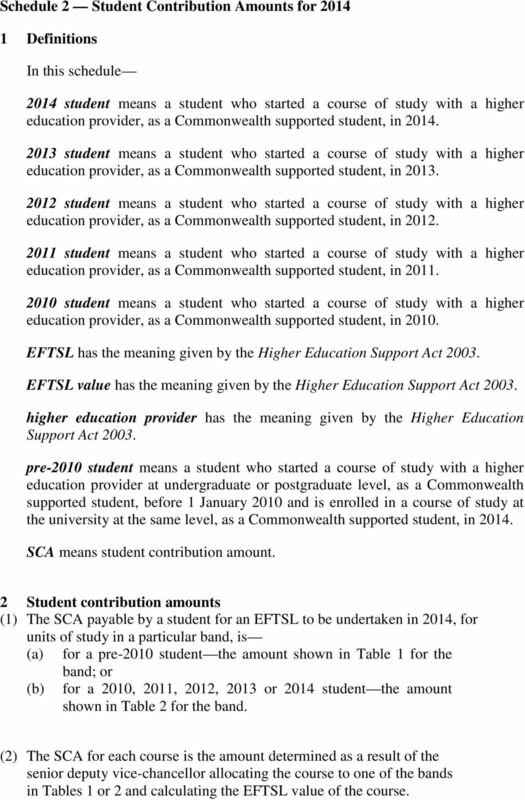 (2) A Commonwealth supported student who pays or defers the student contribution amount under HECS-HELP is taken to have paid the student contribution amount. (3) The university may treat a person as a Commonwealth supported student for a particular course only if the person has paid all fees for that course (including all charges under Schedule 1), by the census date. (4) A person who has not paid the fees required under rule 3(3) may continue as a student for that course only if the student pays fees under rule 4. 4 Tuition fees for domestic students (1) A domestic student who is not a Commonwealth supported student must pay the applicable tuition fee determined under schedule 3, unless the student is an exempt student. (2) A domestic student who defers payment of any of the tuition fee under FEE HELP is taken to have paid that fee. 5 Tuition fees for overseas students (1) An overseas student must pay the applicable tuition fee determined under schedule 4. 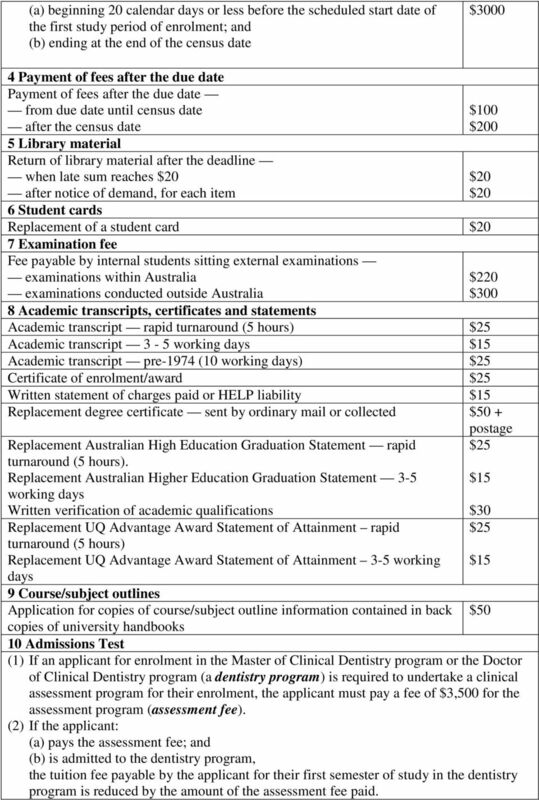 (2) Despite rule 5(1), an overseas student who (a) gains permanent residency status before the census date; and (b) provides the academic registrar with satisfactory evidence of permanent residency status before the census date; and (c) continues enrolment at the university as a domestic student, must pay the tuition fee under rule 4(1). 4 6 Payment of fees (1) The fees imposed by these rules for a semester are payable by the date set by the academic registrar as the date by which such fees are due to be paid. (2) The fees imposed by these rules for a teaching period are payable by the date set by the academic registrar as the date by which such fees are due to be paid. (3) A student excluded or suspended under a university statute or rule must pay outstanding fees. (4) A change of enrolment that takes effect after the census date does not reduce the fee that the student must pay. 7 Prepayment of administrative charges (1) A student must, before taking any of the actions set out under the heading Administrative charges in Schedule 1, pay the relevant administrative charge. 7A (2) A separate charge is payable for each action and for each time action is taken. (3) The action will be effective only if the applicable charge is paid. Student Services and Amenities Fee (SSAF) (1) A student must pay the applicable student services and amenities fee set out in Schedule 1. 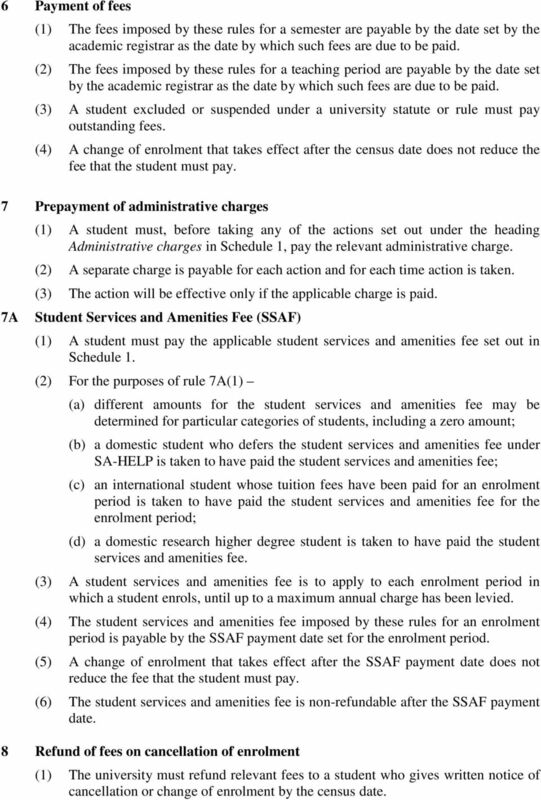 (2) For the purposes of rule 7A(1) (a) different amounts for the student services and amenities fee may be determined for particular categories of students, including a zero amount; (b) a domestic student who defers the student services and amenities fee under SA-HELP is taken to have paid the student services and amenities fee; (c) an international student whose tuition fees have been paid for an enrolment period is taken to have paid the student services and amenities fee for the enrolment period; (d) a domestic research higher degree student is taken to have paid the student services and amenities fee. (3) A student services and amenities fee is to apply to each enrolment period in which a student enrols, until up to a maximum annual charge has been levied. (4) The student services and amenities fee imposed by these rules for an enrolment period is payable by the SSAF payment date set for the enrolment period. (5) A change of enrolment that takes effect after the SSAF payment date does not reduce the fee that the student must pay. (6) The student services and amenities fee is non-refundable after the SSAF payment date. 8 Refund of fees on cancellation of enrolment (1) The university must refund relevant fees to a student who gives written notice of cancellation or change of enrolment by the census date. 5 (2) A student excluded or suspended under a university statute or rule is not entitled to a refund. (3) A student may appeal to the academic registrar in writing against a refusal to provide a refund. 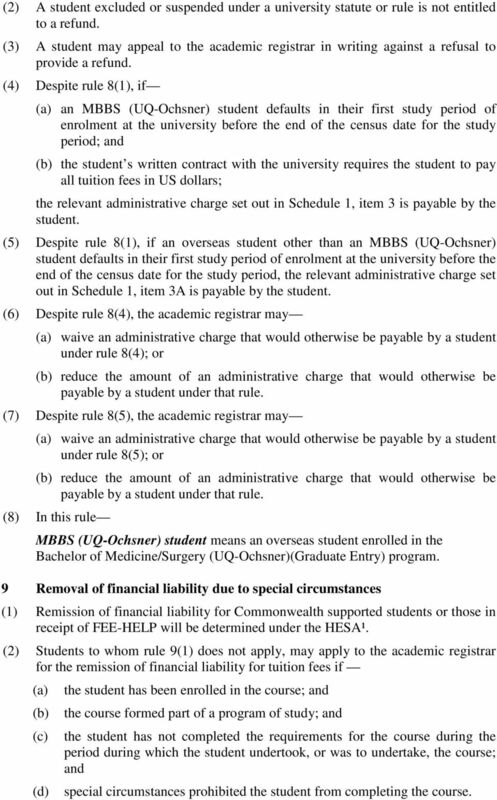 (4) Despite rule 8(1), if (a) an MBBS (UQ-Ochsner) student defaults in their first study period of enrolment at the university before the end of the census date for the study period; and (b) the student s written contract with the university requires the student to pay all tuition fees in US dollars; the relevant administrative charge set out in Schedule 1, item 3 is payable by the student. 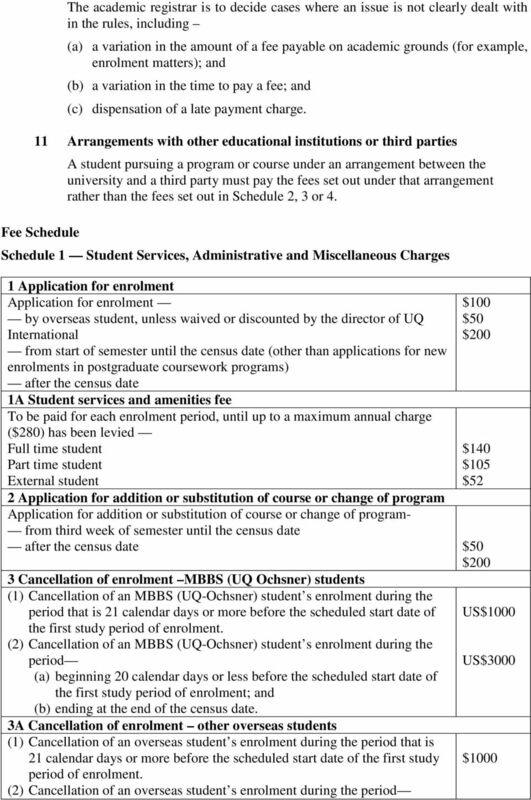 (5) Despite rule 8(1), if an overseas student other than an MBBS (UQ-Ochsner) student defaults in their first study period of enrolment at the university before the end of the census date for the study period, the relevant administrative charge set out in Schedule 1, item 3A is payable by the student. (6) Despite rule 8(4), the academic registrar may (a) waive an administrative charge that would otherwise be payable by a student under rule 8(4); or (b) reduce the amount of an administrative charge that would otherwise be payable by a student under that rule. (7) Despite rule 8(5), the academic registrar may (a) waive an administrative charge that would otherwise be payable by a student under rule 8(5); or (b) reduce the amount of an administrative charge that would otherwise be payable by a student under that rule. (8) In this rule MBBS (UQ-Ochsner) student means an overseas student enrolled in the Bachelor of Medicine/Surgery (UQ-Ochsner)(Graduate Entry) program. 9 Removal of financial liability due to special circumstances (1) Remission of financial liability for Commonwealth supported students or those in receipt of FEE-HELP will be determined under the HESA¹. (2) Students to whom rule 9(1) does not apply, may apply to the academic registrar for the remission of financial liability for tuition fees if (a) (b) (c) (d) the student has been enrolled in the course; and the course formed part of a program of study; and the student has not completed the requirements for the course during the period during which the student undertook, or was to undertake, the course; and special circumstances prohibited the student from completing the course. 9 Schedule 2 Student Contribution Amounts for Definitions In this schedule 2014 student means a student who started a course of study with a higher education provider, as a Commonwealth supported student, in student means a student who started a course of study with a higher education provider, as a Commonwealth supported student, in student means a student who started a course of study with a higher education provider, as a Commonwealth supported student, in student means a student who started a course of study with a higher education provider, as a Commonwealth supported student, in student means a student who started a course of study with a higher education provider, as a Commonwealth supported student, in EFTSL has the meaning given by the Higher Education Support Act EFTSL value has the meaning given by the Higher Education Support Act higher education provider has the meaning given by the Higher Education Support Act pre-2010 student means a student who started a course of study with a higher education provider at undergraduate or postgraduate level, as a Commonwealth supported student, before 1 January 2010 and is enrolled in a course of study at the university at the same level, as a Commonwealth supported student, in SCA means student contribution amount. 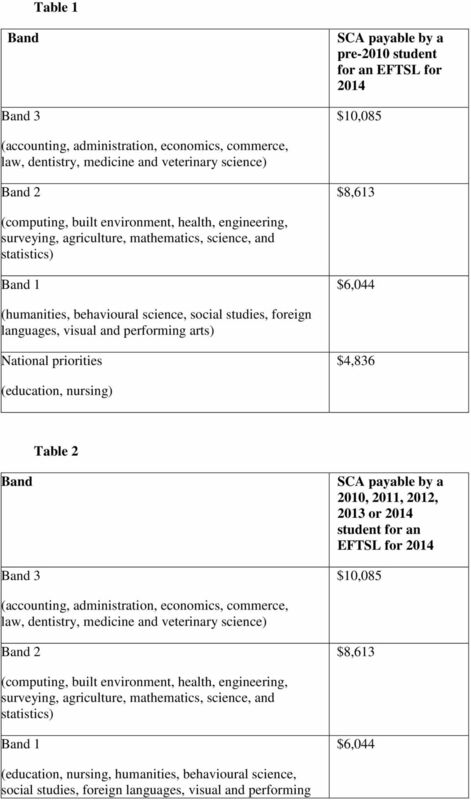 2 Student contribution amounts (1) The SCA payable by a student for an EFTSL to be undertaken in 2014, for units of study in a particular band, is (a) for a pre-2010 student the amount shown in Table 1 for the band; or (b) for a 2010, 2011, 2012, 2013 or 2014 student the amount shown in Table 2 for the band. (2) The SCA for each course is the amount determined as a result of the senior deputy vice-chancellor allocating the course to one of the bands in Tables 1 or 2 and calculating the EFTSL value of the course. 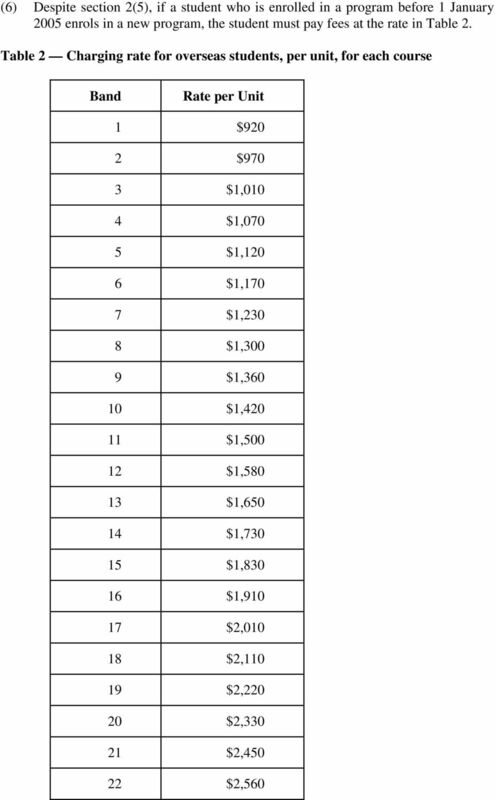 13 32 $4, $4, $4, $4, $5,070 3 Pre-2005 students (1) A domestic tuition fee student who enrolled and commenced study in the student s current undergraduate program before 1 January 2005 will not be required to pay a tuition fee for a course that is a higher amount than that applicable at the time of the student s enrolment in the current undergraduate program. 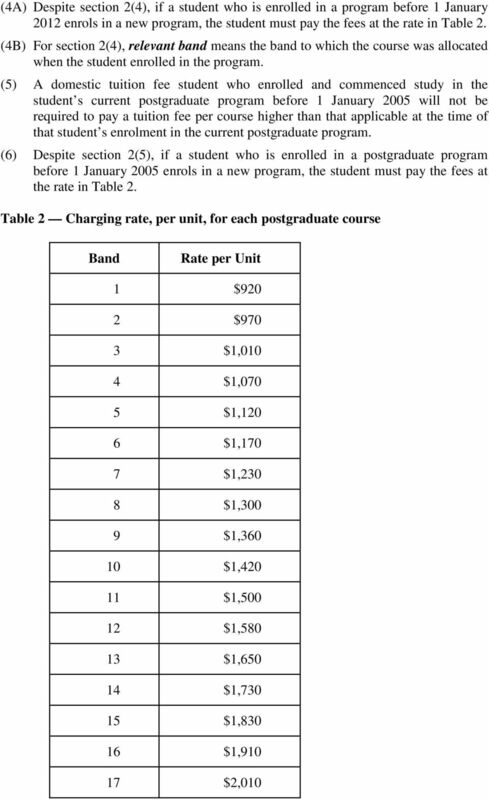 (2) Despite section 3(1), if a student who enrolled in an undergraduate program before 1 January 2005 enrols in a new program, the student must pay fees at the rate set out in Table 1. 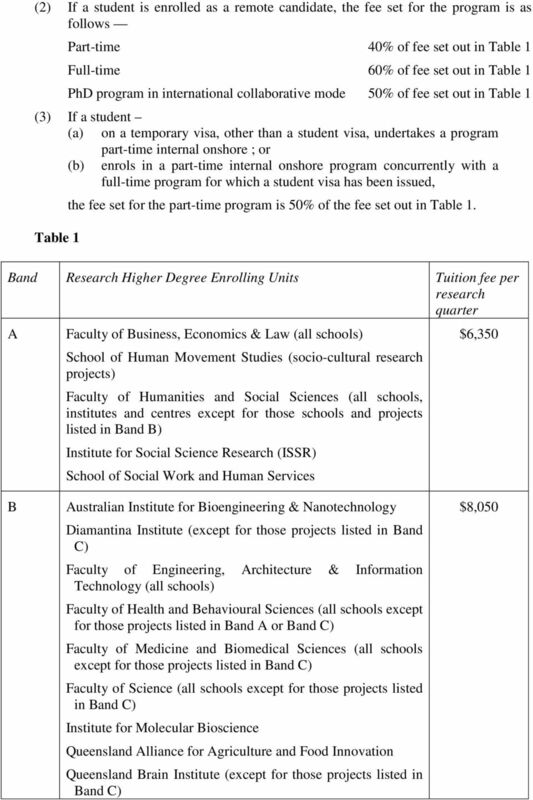 Part B Postgraduate Programs 1 Fees for domestic students A domestic student who enrols in a course in a postgraduate program must pay fees determined for that course. 1A Fees for non-award and cross-institutional domestic students If a domestic student enrols in a postgraduate course as a non-award student, or a cross-institutional student, in a year, the student must pay the postgraduate domestic tuition fee determined for the course for the year. 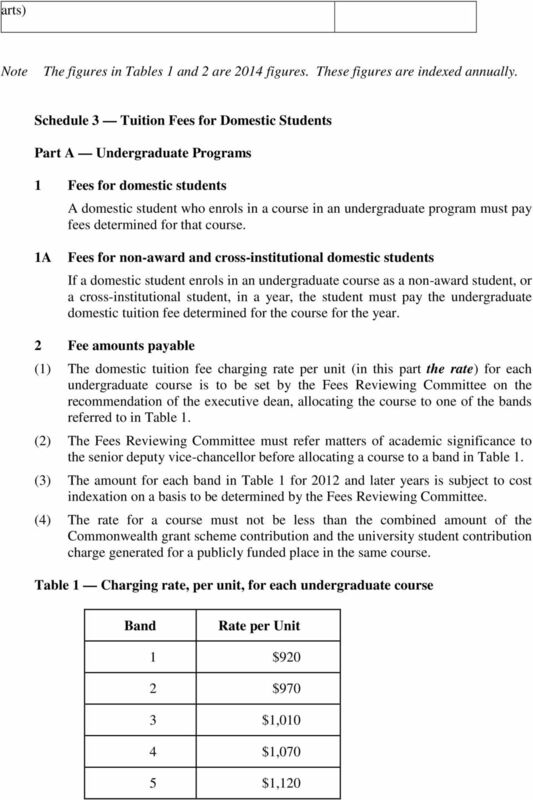 2 Fee amounts payable (1) The domestic tuition fee charging rate per unit (in this part the rate) for each course undertaken in the postgraduate program is to be set by the Fees Reviewing Committee on the recommendation of the executive dean, allocating the course to one of the bands shown in Table 2. 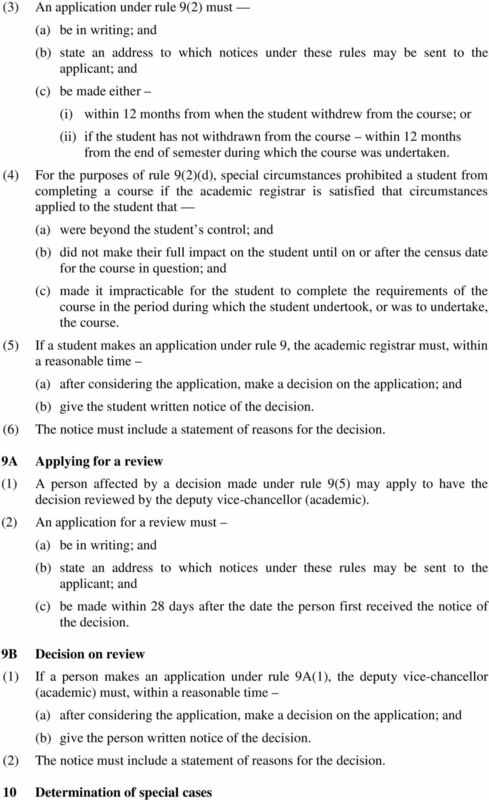 (2) The Fees Reviewing Committee must refer matters of academic significance to the senior deputy vice-chancellor before allocating a course to a band in Table 2. (3) The amount for each band set out in Table 2 for 2012 and later years is subject to cost indexation on a basis to be determined by the Fees Reviewing Committee. (4) A domestic student who has enrolled in a postgraduate program before 1 January 2012 will continue to be charged tuition fees for courses in subsequent years based on the allocation of those courses to bands at the time of the initial enrolment of the domestic student in the postgraduate program. 15 18 $2, $2, $2, $2, $2, $2, $2, $2, $3, $3, $3, $3, $3, $3, $4, $4, $4, $4, $5,070 Schedule 4 Tuition Fees for Overseas Students Part A Research Degrees 1 Fees for overseas students (1) An overseas student who enrols (a) in an MPhil or a PhD; or (b) as a non-award research study abroad student, must pay the fee set out in Table 1. 17 C School of Psychology School of Social Science (archaeology research projects) Sustainable Minerals Institute Diamantina Institute (clinical research projects) Faculty of Medicine and Biomedical Sciences (all schools clinical research projects) Faculty of Health and Behavioural Sciences (all schools clinical research projects, except for schools listed in Band A or Band B) Queensland Brain Institute (clinical research projects) School of Veterinary Sciences (clinical research projects) $10,320 Part B Coursework Degrees 1 Fees for overseas students An overseas student who enrols in a course must pay fees determined for that course. 1A Fees for non-award and cross-institutional overseas students If an overseas student enrols in a course as a non-award student, or a crossinstitutional student, in a year, the student must pay the overseas student fee determined for the course for the year. 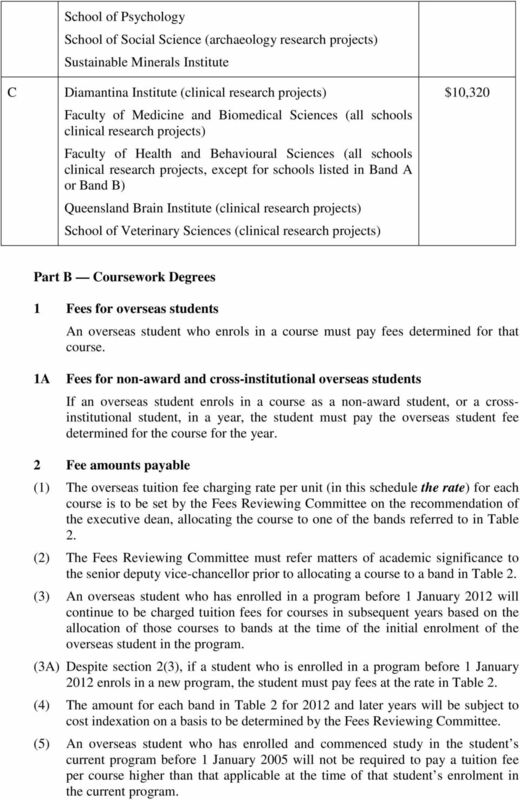 2 Fee amounts payable (1) The overseas tuition fee charging rate per unit (in this schedule the rate) for each course is to be set by the Fees Reviewing Committee on the recommendation of the executive dean, allocating the course to one of the bands referred to in Table 2. (2) The Fees Reviewing Committee must refer matters of academic significance to the senior deputy vice-chancellor prior to allocating a course to a band in Table 2. (3) An overseas student who has enrolled in a program before 1 January 2012 will continue to be charged tuition fees for courses in subsequent years based on the allocation of those courses to bands at the time of the initial enrolment of the overseas student in the program. 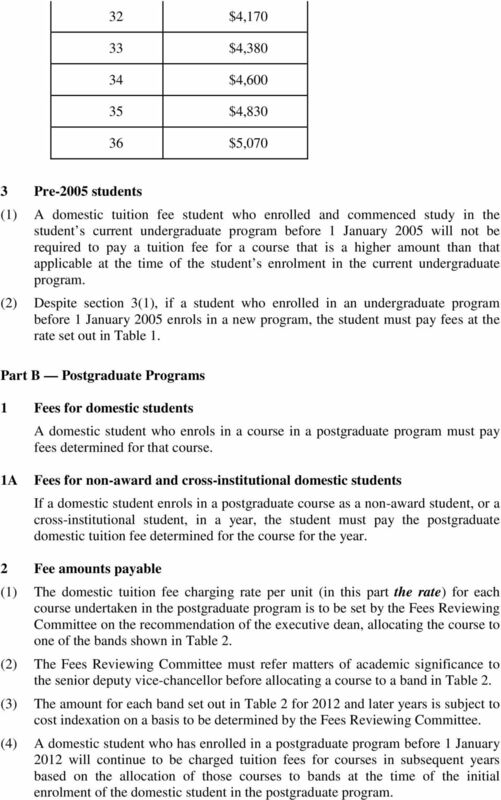 (3A) Despite section 2(3), if a student who is enrolled in a program before 1 January 2012 enrols in a new program, the student must pay fees at the rate in Table 2. (4) The amount for each band in Table 2 for 2012 and later years will be subject to cost indexation on a basis to be determined by the Fees Reviewing Committee. (5) An overseas student who has enrolled and commenced study in the student s current program before 1 January 2005 will not be required to pay a tuition fee per course higher than that applicable at the time of that student s enrolment in the current program. 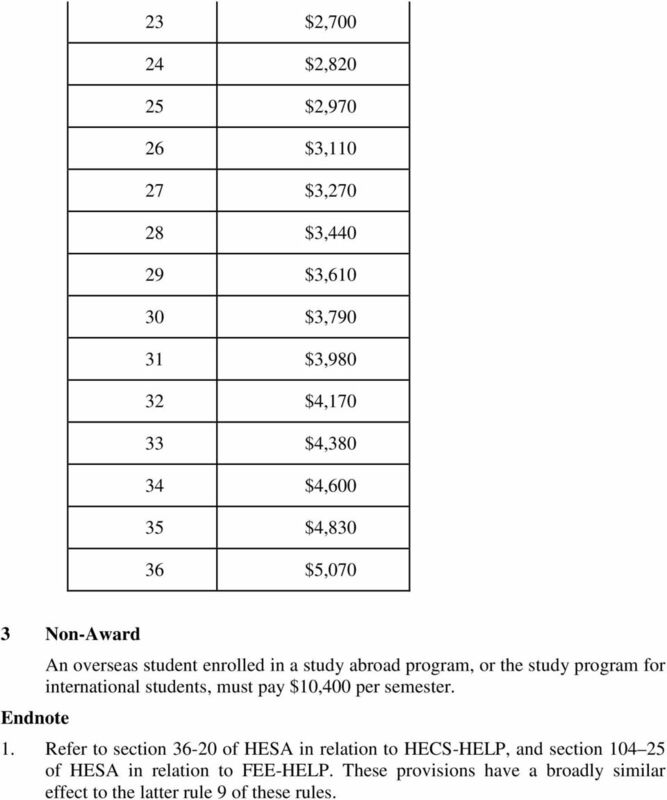 19 23 $2, $2, $2, $3, $3, $3, $3, $3, $3, $4, $4, $4, $4, $5,070 3 Non-Award An overseas student enrolled in a study abroad program, or the study program for international students, must pay $10,400 per semester. Endnote 1. 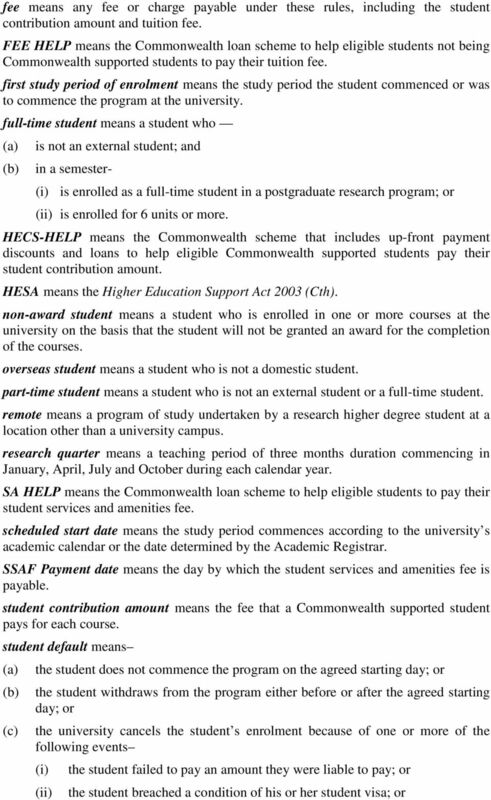 Refer to section of HESA in relation to HECS-HELP, and section of HESA in relation to FEE-HELP. These provisions have a broadly similar effect to the latter rule 9 of these rules. academic registrar means the university s academic registrar. FACULTY OF PHARMACY MASTER OF PHARMACY KEY INFORMATION The Master of Pharmacy course provides an alternative mode of entry into the pharmacy profession for applicants with a previous university degree. REMISSION OF DEBT. 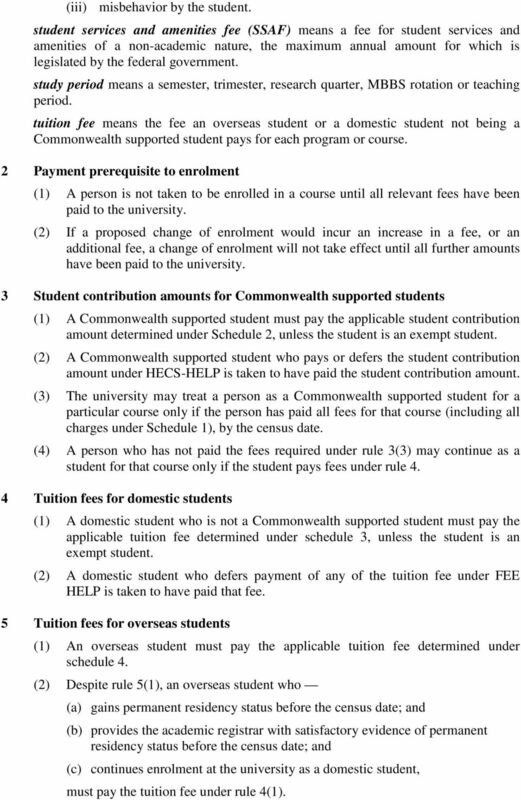 Commonwealth supported and domestic FEE-HELP students. Who can use this form? What is this form used for?